All modern Land O Lakes vehicles come with fuel injection systems, so it's a topic Land O Lakes drivers need to know something about. The mighty fuel injector is a valve that delivers the gas or diesel fuel to the right place, in the right amount, at the right time; to be mixed with air and burned in the engine. So how many fuel injectors does your car have? There's one for each cylinder. So four, six or eight for most folks in Land O Lakes, FL. Some vehicles have 10 or 12 cylinders. The engine control computer makes adjustments to the fuel injector as it monitors the engine and other sensors. Fuel injectors are a pretty high-tech. Tuffy Tire & Auto Service Center Land O Lakes can help Land O Lakes drivers with a fuel injector cleaning service. What's the benefit? In order to work right, the fuel injectors have to deliver the fuel at a precise pressure at a very precise time. It's that the fuel is sprayed in a particular pattern as determined by the engine design. Over time, varnish can start to build up in the fuel injectors, effecting the pressure, pattern and timing of the fuel charge. The result is that the fuel doesn't get burned as efficiently as it could. That robs performance and hurts . What about dirty fuel – how does that affect the fuel injectors? The fuel injectors are the last stop in the fuel system. It starts at the fuel tank. Frankly, the best way to keep your fuel injectors working well is to use high quality fuel. It's tempting to shop for bargains in Land O Lakes with fuel prices as high as they are, but major brands in the Land O Lakes, FL area have better detergents and additives and deliver consistent quality. It's to replace the fuel filter when your recommends it. That's part of a comprehensive fuel system cleaning. 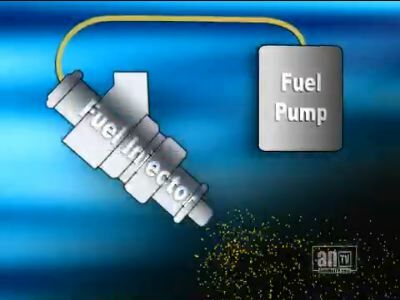 There are different kinds of fuel injection systems. Port fuel injection systems, the kind most gasoline engines have, operate at 60 pounds per square inch. The injectors for the new gas direct injection engines Land O Lakes drivers are starting to see require 10 to 30 times as much pressure. And some diesel engines for passenger vehicles have injectors that operate at 30,000 pounds or more per square inch. There's no room for dirt and gum in a precision part like that. There are a lot of good products available in Land O Lakes, FL that can clean fuel injectors. They're best used to prevent fouling in the fuel injectors. Many can't clean a seriously gummed up injector – that requires a professional deep cleaning, like those we offer at Tuffy Tire & Auto Service Center Land O Lakes in Land O Lakes. But putting the cleaner in the fuel tank after you've had Tuffy Tire & Auto Service Center Land O Lakes take a look at your fuel system will help keep it clean. Be sure to read the label for directions.